Lagos — Children's rights groups are demanding a probe into the death of at least eight schoolchildren after a building collapsed in Nigeria. Scores of other people were trapped in the rubble after the building fell in the commercial city of Lagos on Wednesday. Dr Hussaini Abdu, Country Director of Plan International Nigeria, called on the Lagos state government to launch an inquiry into the incident. "Government must ensure that all persons found culpable for dereliction of duties are punished according to the laws of the country," he said. "This incidence has further highlighted the urgent need for all relevant stakeholders to take urgent actions on issues of safety in schools across the country." Abdu further called on the state government and all relevant institutions across all levels to prioritise protecting the Nigerian child from harm. He said while Nigeria had endorsed the Safe School Declaration in 2018, implementation was lacking. The collapse of buildings is rife in the West African country. Some 84 South Africans were among 115 people killed in 2014 after a guesthouse located within the church of prominent religious leader, TB Joshua, collapsed. 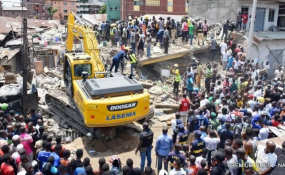 Joshua blamed the collapse on an aircraft that hovered over the building during the church service but experts attributed this to structural failure. The incident, also in Lagos, caused a diplomatic tiff between the two countries (South Africa and Nigeria).